Kendall Versilon Non-woven All Purpose Sponges. These sponges are Ideal for applying ointments, prepping wiping needles and more. They are a highly absorbent, cost-effective and virtually lint free. Made of a rayon and polyester blend that is soft to the touch and limits trauma. It is also virtually lint free making them safer for the patient. 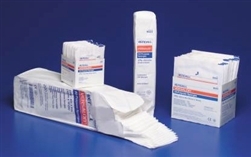 Available in a variety of sizes, plys and sterile and non-sterile versions.